Richard William Gates III (born April 27, 1972) is an American former political consultant and lobbyist who has pleaded guilty to conspiracy against the United States and making false statements in the investigation into Russian interference in the 2016 United States elections. He is a longtime business associate of Paul Manafort and served as deputy to Manafort when the latter was campaign manager of the Donald Trump presidential campaign in 2016, and after under Kellyanne Conway. Gates and Manafort were both indicted in October 2017 on charges related to their consulting work with pro-Russian political figures in Ukraine. Additional charges were filed in District Court for the Eastern District of Virginia on February 21, 2018, however these charges were withdrawn on February 27, 2018, without prejudice, as agreed to in his plea bargain with Special Counsel Robert S. Mueller III. Gates is the son of retired U.S. Army Lieutenant Colonel Richard W. Gates Jr., who is also the founder and CEO of the Gates Group International, a management and information technology firm based in Prince George County, Virginia. An Army brat, Gates was born in Fort Lee, Virginia and lived on several military installations in Kentucky, North Carolina, and Germany as a boy, before his family settled in Prince George, Virginia. After graduating from Prince George High School in 1990, Gates graduated from the College of William & Mary (1994) with a degree in government. Gates was a member of the Sigma Chi fraternity in college. Later, he earned a Master of Public Policy degree from George Washington University. In 1995, Gates married Sarah Garnett. They have four children. Early in his career, Gates was appointed to the first class of the Falls Church Fellows program at the Falls Church Anglican, during which he also worked as an intern at the Washington, D.C., consulting firm Black, Manafort, Stone and Kelly. There, he worked with Republican lobbyist Rick Davis, eventually going to work for the two business partners in 2006 at their new consulting firm, Davis Manafort, with an office in Kiev, Ukraine. Among the clients Gates worked with were Ukrainian president Viktor Yanukovych and Russian oligarch Oleg Deripaska, taking over this work when Davis left the firm in 2008 to work on the presidential campaign of John McCain. Together, they were instrumental in brokering a meeting between McCain and Deripaska in 2006. In June 2016, when Donald Trump promoted Manafort to the post of campaign manager, Gates began to work for the campaign as Manafort's deputy handling the day-to-day activities of the campaign including taking responsibility for apparent plagiarism in Melania Trump's speech at the Republican National Convention. Gates stayed on as number two in the campaign under Steve Bannon after Manafort was forced out, and then went to work as deputy chairman of the Donald Trump Inaugural Committee. He helped to form a pro-Trump nonprofit group called America First Policies but was removed from the organization after his involvement with Manafort's overseas ventures was exposed. On October 27, 2017, Gates and Manafort were indicted by a federal grand jury as part of the Special Counsel investigation into Russian interference in the 2016 United States elections and related matters. The twelve-count indictment charges the two men with conspiracy against the United States, making false statements, money laundering, and failing to register as foreign agents for Ukraine as required by the Foreign Agents Registration Act. 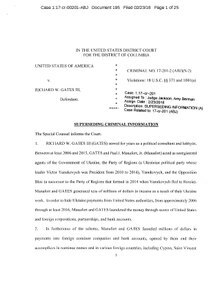 The charges arise from his consulting work for a pro-Russian government in Ukraine and are unrelated to the Trump campaign. Manafort and Gates surrendered to the FBI on October 30, 2017, and at a court hearing both chose to plead not guilty. While awaiting trial, Manafort was released on $10 million bond and Gates was released on $5 million bond. Prosecutors described them as flight risks, and as a condition of pretrial release, both men surrendered their passports and were placed under house arrest. U.S. District Court for the District of Columbia Judge Amy Berman Jackson issued an order on December 22, 2017, demanding that Gates explain why his comments in a brief, videotaped address to the fundraiser held in an Arlington, Va., Holiday Inn, on December 19, did not amount to a violation of the gag order she issued in the case. Of particular concern to Jackson is Gates' involvement with the eccentric Washington-area lobbyist who organized the event, Jack Burkman. On January 23, 2018, CNN reported that Gates had added prominent white-collar attorney Tom Green to his defense team. The action could relate to a change in strategy, e.g. from a flat not-guilty plea to some kind of cooperation with prosecutors. On February 22, The Daily Beast reported that Gates fired Green, but later corrected its story. On February 7, 2018, three of Gates' attorneys cited 'irreconcilable differences' with their client in court hearing with Judge Amy Berman Jackson in their motion to withdraw as Gates’ counsel. On February 15, 2018, CNN reported that Gates had begun finalizing a plea deal with Special Counsel Robert Mueller's office, indicating he was poised to cooperate in the Special Counsel's investigation, as he had undergone his "Queen for a Day" interview, in which he answered any and all questions from the Special Counsel's team, including about his own case and other potential criminal activity he witnessed or participated in, with the only stipulation being that he could not lie. During this proffer session interview, on February 1, Gates lied to FBI investigators, and this false statement made by Gates was incorporated into the plea bargain that he subsequently entered into. On February 22, 2018, Mueller revealed new charges in the Manafort and Gates case, filed on February 21. Unlike previous indictments, the superseding indictment was issued by a federal grand jury in the US District Court for the Eastern District of Virginia, and contains 32 counts: 16 counts related to false individual income tax returns, seven counts of failure to file reports of foreign bank and financial accounts, five counts of bank fraud conspiracy, and four counts of bank fraud. On February 23, 2018, Gates pleaded guilty to one count of false statements and one count of conspiracy against the United States. The plea bargain included an agreement to cooperate with the Mueller investigation. Federal guidelines suggest Gates will face a sentence of 57 to 71 months, but these are only advisory and are subject to discretion. His sentencing date has been repeatedly postponed, with a March 2019 court filing requesting another sixty day extension, stating Gates "continues to cooperate with respect to several ongoing investigations," suggesting that his cooperation extended beyond matters involving Manafort, who had already been convicted in two courts by that time. Gates was sued by his former attorneys, of Doar Rieck Kaley & Mack, for $368,525.34 in unpaid legal fees. Gates, who struck a plea deal with Federal prosecutors that included agreeing to testify against Manafort, became the government's star witness during Manafort's trial. Manafort was convicted of 8 counts of tax and bank fraud. During the trial, Gates testified that he and Manafort carried out an elaborate offshore tax-evasion and bank fraud scheme using offshore shell companies and bank accounts in Cyprus, St. Vincent and the Grenadines and the United Kingdom to funnel millions of dollars from their political consulting work in Ukraine. Gates said he concealed the accounts and the income from U.S. tax authorities by disguising the income as loans with falsified bank loan documents. Gates also testified that he embezzled hundreds of thousands of dollars from Manafort, and funded an expensive extramarital relationship with money embezzled from Manafort. In a February 7, 2019, hearing, prosecutors speculated that Manafort had concealed facts about his activities to enhance the possibility of his receiving a pardon. They said that Manafort's work with Ukraine had continued after he had made his plea deal and that during the Trump campaign, he met with Gates, and also with alleged Russian intelligence agent Konstantin Kilimnik, in an exclusive New York cigar bar. Gates said the three left the premises separately, each using different exits. According to prosecutors in the special counsel's office, Gates continued to provide information relevant to multiple "ongoing investigations" after the conclusion of Manafort's federal case in March 2019, and Gates' sentencing has been delayed while that cooperation continues. Russian oligarch Oleg Deripaska has sued Paul Manafort and Rick Gates for more than $25 million in damages over business deals involving his companies. The complaint filed in a New York state court in 2018 alleges that Manafort and Gates bilked his companies out of millions of dollars given to them to invest. The lawsuit relies, in part, on allegations that were outlined in Special Counsel Robert Mueller's indictments against Manafort and Gates. Deripaska has also made similar claims in previous legal complaints filed against Manafort and Gates in the Cayman Islands in 2014 and in a Virginia state court in 2015 accusing Manafort and Gates of taking $19 million intended for investment then failing to account for the funds or return them. ^ a b "Garnett-Gates" (PDF). The Hopewell News. June 19, 1995. p. 4. ^ a b c d Confessore, Nicholas; Meier, Barry (June 16, 2017). "How the Russia Investigation Entangled a Manafort Protégé". The New York Times. ISSN 0362-4331. Retrieved October 30, 2017. ^ a b c Perez, Evan; Herb, Jeremy (October 30, 2017). "Manafort, Gates charged with conspiracy against US". CNN. Retrieved October 30, 2017. ^ a b c Breuninger, Kevin (February 23, 2018). "Former Trump campaign official Rick Gates pleads guilty to lying and conspiracy against the US". CNBC. Retrieved February 23, 2018. ^ Peoples, Steve; Horwitz, Jeff (November 2, 2017). "Rick Gates: A Trump survivor is tested by Mueller probe". Associated Press. Retrieved August 20, 2018. ^ "Sisisky nominates students considered for academies" (PDF). The Hopewell News. March 5, 1990. p. 7. ^ a b "Rick Gates, indicted in Trump-Russia probe, owns home in Richmond". WRIC. October 30, 2017. Retrieved October 31, 2017. ^ DePompa, Rachel (October 30, 2017). "Manafort's former business partner has home in Richmond". WWBT. Retrieved October 31, 2017. ^ Birnbaum, Jeffrey H.; Solomon, John (January 25, 2008). "Aide Helped Controversial Russian Meet McCain". ISSN 0190-8286. Retrieved October 30, 2017. ^ Jacobs, Ben (October 30, 2017). "Who is Rick Gates, Manafort's right-hand man and alleged partner in crime?". The Guardian. ISSN 0261-3077. Retrieved October 30, 2017. ^ Choma, Russ (October 30, 2017). "Who Is Rick Gates?". Mother Jones. Retrieved October 30, 2017. ^ Apuzzo, Matt; Goldman, Adam; Schmidt, Michael S.; Rosenberg, Matthew (October 30, 2017). "Former Trump Aides Charged as Prosecutors Reveal New Campaign Ties With Russia". The New York Times. Retrieved October 30, 2017. ^ Halper, Evan (October 30, 2017). "$10 million bond for ex-Trump chairman Paul Manafort after not guilty plea in Russia probe". Los Angeles Times. Retrieved October 30, 2017. ^ "Judge irked by Gates legal defense fundraiser". POLITICO. Retrieved December 23, 2017. ^ Polantz, Katelyn (January 23, 2018). "Gates may be negotiating with Mueller's team". CNN. Retrieved January 24, 2018. ^ Woodruff, Betsy (February 22, 2018). "Ex-Trump Staffer Rick Gates to Plead Guilty in Russia Probe". The Daily Beast. Retrieved June 8, 2018. ^ Delk, Josh (February 22, 2018). "CORRECTED: ABC reports Gates has retained veteran DC lawyer". The Hill. Retrieved June 8, 2018. ^ Gerstein, Josh (February 7, 2018). "Judge holds hearing on Gates' lawyers request to exit case". Politico. Retrieved February 8, 2018. ^ Polantz, Katelyn; Murray, Sara (February 15, 2018). "A top Trump campaign adviser close to plea deal with Mueller". CNN. Retrieved February 16, 2018. ^ Polantz, Katelyn (February 17, 2018). "Special counsel court filing reveals new bank fraud allegations against Manafort". CNN. Retrieved February 17, 2018. ^ Polantz, Katelyn; Murray, Sara (February 15, 2018). "A top Trump campaign adviser close to plea deal with Mueller". CNN. Retrieved February 17, 2018. ^ Gerstein, Josh. "New charges filed in Manafort-Gates case". POLITICO. Retrieved February 21, 2018. ^ Barrett, Devlin; Hsu, Spencer S. (February 22, 2018). "Special counsel Mueller files new charges in Manafort, Gates case". The Washington Post. Retrieved February 22, 2018. ^ "Ex-Trump Aide Rick Gates Plea Hearing". Bloomberg.com. Retrieved February 23, 2018. ^ "Rick Gates continues to cooperate in 'several ongoing' investigations and is not ready for sentencing". Washington Post. ^ Griffiths, Brent D.; Gerstein, Josh (October 10, 2018). "Former Rick Gates attorneys sue him for $369,000 in unpaid bills". Politico. ^ Siegel, Joel A. (October 10, 2018). "Case 1:18-cv-09282 Document 1". Politico. ^ "Manafort defense questions star witness Gates about 'secret life'". Reuters. August 7, 2018. Retrieved August 16, 2018. ^ a b Day, Chad (August 9, 2018). "Gates admits crimes with - and embezzlement from - Manafort". Associated Press News. Retrieved August 15, 2018. ^ "Rick Gates, testifying in Manafort trial, admits to affair, London apartment". NBC News. August 7, 2018. Retrieved August 15, 2018. ^ Prokop, Andrew (March 15, 2019). "Top Mueller cooperator Rick Gates continues to cooperate with several investigations". Vox. Retrieved March 20, 2019. ^ "Paul Manafort has a new legal headache. A Russian oligarch is suing him". NBC News. ^ "Analysis | Manafort's Russia connection: What you need to know about Oleg Deripaska". Washington Post.